The alarm goes at 5:10 am. I'm already packed for a fast exit. I hop in the shower-there's no hot water. Damn! Last night I spelled-out that I expected hot water this morning. "No problem," I was told. I go downstairs, complain about the lack of hot water, go back to the room, take a cold water bird bath then go back downstairs to eat. Yesterday the manager had indicated "24 hour food, no problem," but today it looks pretty dicey. The manager takes me behind the kitchen counter and I point at two eggs, two butter-packets and some flat bread. I am served one egg, but it's a pretty tasty oily scramble, so I order another one, loading up for the ride. Back in the room I top off the air pressure in both tires bracing the pump against a table leg to reduce the pain I've been feeling in my left elbow. Bang! I break off the stem on the front tire. I'm not going to be able to save that tube! I'm not super-pissed; it's a convenient location for a flat to happen, and arguably I should've preemptively replaced that tube, since a week earlier I had bent the stem during one of my morning top-off efforts. What the hell. After replacing the tube (and saving a 2-inch strip of it for some unknown future purpose) I do a minor repack to get possessions inside my master grocery-bags, since it looks like it might rain. The front desk says it won't rain. I load the bike, and am I'm finally riding at 7:10 am. At 8:15 I pass a sign "Damascus 50 km." At 9:00 I pass a sign "Damascus 30 km." At 9:09 - "Damascus 23 km." I'm ripping! For a brief stretch after the 50-k marker, the 5-foot wide shoulder I've been riding on becomes 18 inches wide, with a three foot deep drainage culvert immediately to the right. I focus on not getting spooked by traffic. After a few kilometers of this, the wide shoulder returns, and I'm back enjoying my private lane. 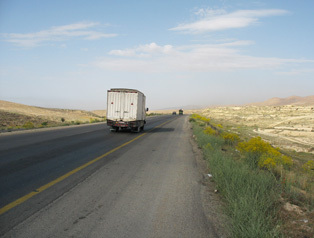 At 9:43 I pass "Damascus 11 km". The ride slows down a bit. 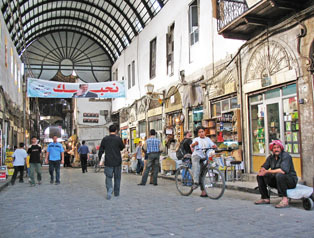 The LP guidebook has indicated that the heart of the city is Martyrs Square, and sure enough, there are signs marked Al-Merjeh. The ride is brainless, except that periodically I find myself in the center lane as lanes merge-in from the right. My pace has slowed as the gentle downhill gives way to flat, but no matter what, my riding day is going to be over long before the midday sun starts beating me up. I hear some strange sound with each tire rotation and then "Pshhh!" - the back's flat. It's 10:04 am. Wow, two flats in one day! And that's after 23 days of problem-free riding! I remember that I won't have to remove the rear tire, if I can find the hole. But the reality of urban riding sets in: it's so noisy that there's no way I'll be able to hear where the leak is. Oh well. I dig through my panniers until I find my last spare tube. I can't afford another flat, so I triple-check the inside and outside of the rear tire, making sure that whatever gave me the flat is not still in-place, ready to take out the replacement tube. A local bicyclist stops and says hello, and I use the opportunity to confirm the route to Al-Merjeh. Apparently I go straight, veer left, then under the underpass, or over the bridge-I'm not really sure-but I'm close. At 10:37 I'm rolling. I stop at the base of an overpass and a local comes over to help the foreigner. He points to a jagged roof line a few hundred meters away, and the other side of the overpass and says "Citadel". That's good, cause that's one of the landmarks I'm looking for. I ask the direction to Hejaz Railway Station and it seems I'm within a few hundred yards of my destination, the LP-recommended Sultan Hotel. I ride on, recheck the LP map, and sure enough-there right ahead of me is the hotel. I go upstairs and the greeting is a little cold, but this hotel is recommended for excellent service in other areas. It's only 11:00 am and my riding day is over. I'm offered a small but decent room with bathroom, 24-hour hot water (I make a point to ask) and even air-conditioning (that doesn't work at first, but finally kicks in). Laundry is also an option, so I turn over my tar-speckled riding jersey, two pairs of socks and a pair of underwear. I enjoy my first warm shower in four days, and then settle down, find the hole in the remaining tube and patch it. It's just after noon and I head out. This time I do get great service from the front desk. 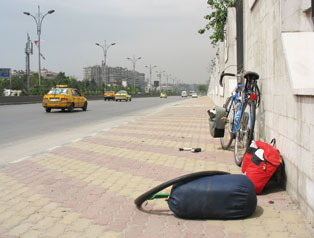 I learn about shared rides to Lebanon from a taxi stand up around the bend. I learn where internet service is, and I convert $40 into Syrian pounds for incidental expenses. I head out, email my contact information to Terry, stop to eat some little pizzas, then stop for French fries, then stop again for sweets. I buy a map of Syria that isn't really much better than the one I'm using, but at $3, who cares. 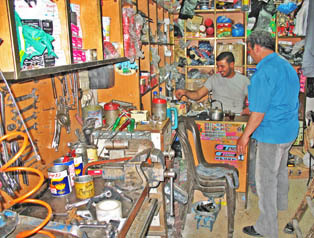 I try to find the backpackers' strip, Sharia Bahsa, but fail, in spite of having a map and a compass. Giving up, I find my way back to the Citadel, through the souq, then to the supposedly cool, but somewhat under whelming coffee shops, then finally to the Christian quarter. I've ridden only two days since the last rest-day, so I'm not sure Damascus will get a second day. My first flat (other than the one in the hotel room!). 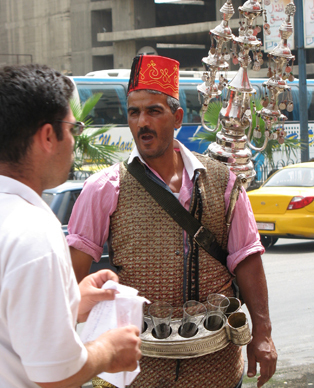 A curbside chai vendor in Damascus.